We have mapped out by Price range the luxury homes currently advertised for sale in Princess Anne Manor by MLS listings on Realtor.ca from the Toronto Real Estate Board. Just 15 minutes to the Lester B Pearson Airport, in Etobicoke Toronto's West End Princess Anne Manor consists of ranch style bungalows from original on wide lots of over 70 ft. The Manor as its known locally is the perfect family community that is being rejuvenated with larger two storey Custom built homes. The original bungalows are hovering around $1 million for a clean but outdated home and the new Custom builds are over $2 million for this exclusive area. The draw is the Secondary School Richview Collegiate which offers French Immersion courses and Gifted Programs. 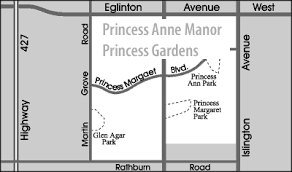 Find all Princess Anne Manor homes for sale at Etobicokehomesforsale.com! You will find listings of some of the most sought after Real Estate in Etobicoke and for that matter Toronto in the Manor and Thorncrest Village. Builders are flocking to buy lots of 70 to 80 feet frontage to create luxury architecture of Modern, contemporary and traditional type larger estates. If your wish list includes beautiful homes on large properties in great family neighbourhoods where the Schools are gifted as your children and the community has a wonderful sense of pride Princess Anne Manor is where you should be looking. The homes are over $1million , transit is good but buses and cars are necessary and there's no room for Condos just some rentals. Landscaping is the norm, new builds are sprouting up even the the ranch bungalows seem to provide plenty of space for todays family. Bigger is better or perhaps updated with todays family functionality is a more correct assumption. The local IGA Thorncrest is offering a wider palate of cooked meals to offset the heavy on slot of Pizza containers filling the Garbage bins everywhere. Times moving fast and Kipling and Islington Avenue are proof. More traffic everywhere makes this suburb adventageous to get away from todays noise. It's quiet, tranquil streets are a joy to meet and greet the neighbours and their dogs. Our closest Remax office to Princess Anne Manor and Thorncrest Village is at 4242 Dundas Street West in the Brunos Plaza east of Royal York Rd. Come and meet with us there!